Knob Hill Farm is a 55+ community in Chester County, Pennsylvania. Homeowners reap the benefits of less upkeep because this age-restricted neighborhood offers low-maintenance attached and single-family homes. Knob Hill Farm truly offers a welcoming and laidback lifestyle with thoughtful amenities in their clubhouse. Though it's situated in a quiet area, Knob Hill Farm is close to big-city entertainment, recreational opportunities, and daily conveniences. 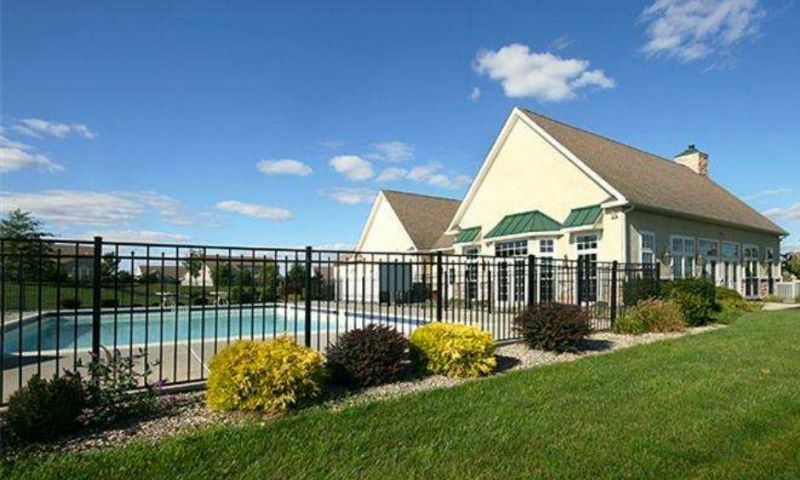 Residents enjoy access to a 6,000 square-foot clubhouse located in Knob Hill Farm. This well-appointed clubhouse is complete with a multi-purpose room, catering kitchen, card room, and great lounge. Homeowners never have to travel far for an invigorating workout because the clubhouse's fully equipped gym is at their disposal. There is a card room and library, ideal for meeting neighbors for a book discussion or fun game night. Knob Hill Farm's thoughtful amenities continue outdoors with a resort-style pool. Those looking to get in touch with nature can host picnics in the gazebo, fish in the pond, and walk or jog on the two-and-a-half-mile trail. This age-restricted community in Chester County began construction in 2005. In 2012, Woodstone Custom Homes, LP completed Knob Hill Farm with 119 homes. Homebuyers can find a resale single-family or attached home. There are 36 carriage homes throughout Knob Hill Farm. These attached homes are about 1,766 square feet in size and include two to three bedrooms, two to three bathrooms, and an attached one or two-car garage. Additionally, there are 83 single-family homes that encompass Knob Hill Farm. Homebuyers can find a detached residence that ranges in size from 1,366 to 4,055 square feet. Homes typically have two to three bedrooms, two to four-and-a-half bathrooms, and an attached two-car garage. Residents of Knob Hill Farm enjoy a carefree lifestyle without having to worry about the upkeep of a large home. Active adults and retirees enjoy the homes with first-floor living and low-maintenance exteriors. This gives them more time to spend with neighbors, friends, and family. Whether attending community events in the clubhouse, hosting family for dinner, or exploring the area, Knob Hill Farm offers the lifestyle that active adults desire. Knob Hill Farm is located in Honey Brook, Pennsylvania. This age-restricted neighborhood in Chester County is situated off Horseshoe Pike and Cambridge Road. Avid golfers will be delighted to know that Honey Brook Golf Club is adjacent to their community. West Chester is less than 30 minutes away and Philadelphia International Airport is an hour's drive away. With only 119 homes yet resort-style amenities, it's easy to see why Knob Hill Farm in Honey Brook is a sought-after age-restricted community in Chester County, PA. Check back soon for more information on the lifestyle in Knob Hill Farm. There are 36 carriage homes throughout Knob Hill Farm. These attached homes are about 1,766 square feet in size and include two to three bedrooms, two to three bathrooms, and an attached one or two-car garage. Please Note: Floor plans are not available at this time. There are 83 single-family homes that encompass Knob Hill Farm. Homebuyers can find a detached residence that ranges in size from 1,366 to 4,055 square feet. Homes typically have two to three bedrooms, two to four-and-a-half bathrooms, and an attached two-car garage. Please Note: Floor plans are not available at this time. 55places.com is not affiliated with the developer(s) or homeowners association of Knob Hill Farm. The information you submit is distributed to a 55places.com Partner Agent, who is a licensed real estate agent. The information regarding Knob Hill Farm has not been verified or approved by the developer or homeowners association. Please verify all information prior to purchasing. 55places.com is not responsible for any errors regarding the information displayed on this website.